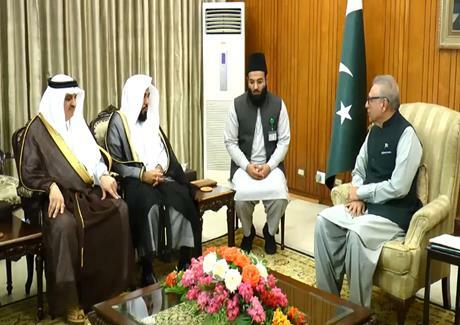 President Dr Arif Alvi has said that Pakistan greatly values its relations with the brotherly country, Saudi Arabia. He said this while talking to Imam-e-Kaaba Sheikh Dr Abdullah Awad Al Juhany, who called on him at the Aiwan-e-Sadr in Islamabad today. Recalling the highly successful visit of the Crown Prince His Royal Highness Prince Muhammad Bin Salman to Pakistan, the President said that Crown Prince won the hearts of Pakistani people by his generous offer of support to Pakistani community. He also welcomed the Kingdom's decision of increase in Hajj quota for Pakistan to two hundred thousand and inclusion of Pakistan in its Road to Makkah initiative. The President pointed out that large Pakistani community in Saudi Arabia is a strong people to people bridge between two brotherly countries. Imam of Masjid Al-Haram said that relationship of Pakistan and Saudi Arabia is not merely a diplomatic one but it is based on faith. He said Pakistan is the strength of Saudi Arabia and hearts of people of both countries beat together. Meanwhile, President Dr Arif Alvi has said that Pakistan remains committed to secure the sacred places and knows well the value of peace and stability in the region. Addressing the event in connection with Baisakhi Festival Celebrations in Islamabad today, he said Kartarpur corridor has been established by the government as a good neighborly gesture. Dr Arif Alvi emphasized the need for good relations between Pakistan and India in the best interest of the region and people of both the countries. He said security situation in the country has been improved to the significant extent that greatly benefited the tourism sector.